We needed to have an impromptu live session to talk about some upcoming additions to the blog and an announcement about our new daily podcast feature – the Turtleboy Book Club. A lot of you have read I Am Turtleboy, and some of you good boys and girls are getting it for Christmas. What I’m going to be doing, starting tomorrow night at 9:30 on the Turtleboy Sports Returns Facebook page, is going over the book one chapter at a time while answering any and all questions from turtle riders. We won’t give away any spoilers as many of you have not read the book but plan to, and we’ll be doing a chapter or 2 per night. Tonight we’re doing Chapter 1 and 2, which is the introduction to the book and my background as an 11 year veteran teacher in the Worcester and Dudley-Charlton Public Schools. More than likely I will be going off on tangents about the topics at hand, but that’s OK. It gives me a chance to hear your feedback, which I greatly value, as well give you people some different content that no one else gets. 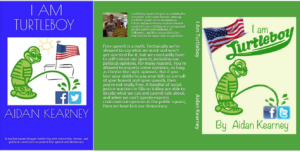 Turtleboy is a movement, and a revolution in the media. We are Turtleboy.